A youthful, quality Irish spirit with legs. Glendalough was founded by “five friends from Wicklow and Dubli'.” They began their journey creating Poitín — a traditional Irish distillate made in very small pot stills, sort of like small batch Irish Moonshine. From there it was a short and easy step into a variety of Irish Whiskies and Herbal-infused Gins as well. Everything is made by hand with a good measure of love. OK… stay with us because Glendalough Triple Barrel Irish Whiskey is a unique thing indeed. First, it is a Single Grain Irish Whiskey. That means that it is a combination of grains — in this case corn and malted barley — distilled and aged on site. They call it “triple barrel” because the spirit is aged three and a half years in ex-Bourbon casks, then six months in Oloroso Sherry casks, and finally it is finished in Madeira casks — for a total of four years of quality aging. Now, as a young Whiskey, we say be patient. Pour your dram, give it a single cube of ice or a spoonful of water, and then let it breath. You will like the results. 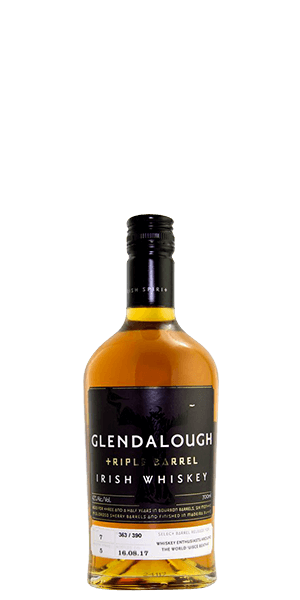 What does Glendalough Triple Barrel Irish Whiskey taste like? The Flavor Spiral™ shows the most common flavors that you'll taste in Glendalough Triple Barrel Irish Whiskey and gives you a chance to have a taste of it before actually tasting it. Rancio and sultana, granola, toffee, and pear. Young and lightly sweet with more raisin, bran, and fresh sawn wood. Medium with a Wine-like lingering. this wiskey should not be sold yet i another ten years , it is far from being ready for drinking ! my friends moonshine that is really awful taste better than this ! do not sell this to people that enjoy wiskey please !